Omega's Wireless RTD & Thermocouple Transmitter/Connector Series features stand-alone, compact, battery powered thermocouple & RTD connectors that transmit their readings back to a host receiver up to 120 m (400') away. Each unit can be programmed in the field to work as a type J, K, T, E, R, S, B, N or C calibration connector or RTD inputs. When activated the transmitter/connector will transmit readings continuously at pre set time interval that was programmed by the user during the initial setup. Each transmitter measures and transmits: Thermocouple/RTD Input Reading, Connector Ambient Temperature, RF Signal Strength and Battery Condition to the host and is displayed on the PC screen in real time using the provided software. When used with host receiver UWTC-REC1 data from up to 48 wireless thermocouple connectors can be received and displayed. 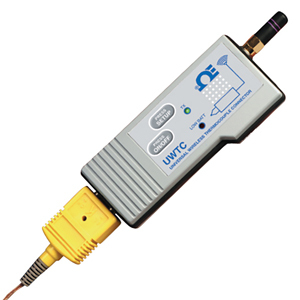 The UWTC RTD and thermocouple transmitter includes free software that converts your PC into a strip chart recorder or data logger so readings can be saved and later printed or exported to a spread sheet file. When used with host Transceiver UWTC-REC2 wireless data from one connector can be re-transmitted out of the receiver by a wired connection as an analog voltage or current to interface with a controller, PLC or data acquisition board. UWTC-2, UWRTD-2: Up to 120 m (400') outdoor line of sight. Up to 45 m (130') indoor/urban. Note: Because of transmission frequency regulations, the UWTC-2 and UWRTD-2 products are approved for use in the United States, Canada, Europe, Mexico, Brazil, China, Korea, and Singapore. Comes with one 3.6 V Lithium battery, mounting bracket, Type K beaded wire thermocouple (for UWTC), and user manual. "-2J" Model for Japan Market has been discontinued.